Though Kim Jae Joong’s global fans weren′t able to actually attend the press conference for his upcoming drama, they managed to make a big splash anyway – via rice garlands. On May 17, a press conference was held for Kim Jae Joong′s MBC drama Time Slip Dr. Jin, at Seoul’s Lotte Hotel. Before the press conference, the hallway was stacked with rows of rice garlands from fans all over the world. Rice garlands are given as congratulatory gifts in lieu of the traditional flower garlands, which are then donated to charity. 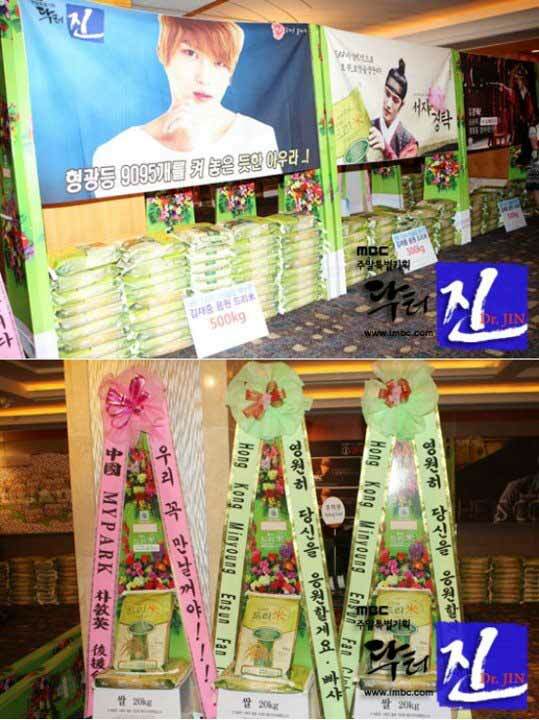 It was revealed a total of 23.68 tons of rice had been donated by fans from 31 different countries around the world. These included fans and fan clubs from Indonesia, Singapore, Hong Kong, Brazil, Russia, Spain, Taiwan, Thailand, Malaysia, Turkey, Germany and more. In addition, it was revealed this was the largest amount of rice garlands collected for a celebrity, more than doubling the previous record.